Every developer at a certain point in his carreer is faced with the difficult task of scheduling jobs dynamically. In this post we are going to create a simple application for dynamically scheduling jobs using a REST API. 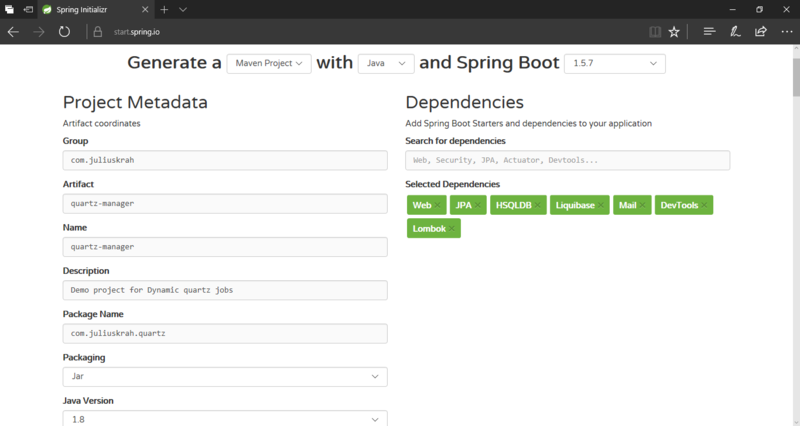 We will dynamically create jobs that sends emails to a predefined group of people on a user defined schedule using Spring Boot. Job - an interface to be implemented by components that you wish to have executed by the scheduler. The interface has one method execute(...). This is where your scheduled task runs. Information on the JobDetail and Trigger is retrieved using the JobExecutionContext. JobDetail - used to define instances of Jobs. This defines how a job is run. Whatever data you want available to the Job when it is instantiated is provided through the JobDetail. Quartz provides a Domain Specific Language (DSL) in the form of JobBuilder for constructing JobDetail instances. .withIdentity("myJob", "group1") // name "myJob", group "group1"
provides instruction on when the job is run. Quartz provides a DSL (TriggerBuilder) for constructing Trigger instances. Scheduler - the main API for interacting with the scheduler. A Scheduler’s life-cycle is bounded by it’s creation, via a SchedulerFactory and a call to its shutdown() method. Once created the Scheduler interface can be used to add, remove, and list Jobs and Triggers, and perform other scheduling-related operations (such as pausing a trigger). However, the Scheduler will not actually act on any triggers (execute jobs) until it has been started with the start() method. The above are the dependencies needed for Quartz with Spring integration. By the end of this post we will be able to schedule Quartz jobs dynamically to send emails using a REST API. You declare which JobStore your scheduler should use (and it’s configuration settings) in the properties file (or object) that you provide to the SchedulerFactory that you use to produce your scheduler instance. RAMJobStore - is the simplest JobStore to use, it is also the most performant (in terms of CPU time). RAMJobStore gets its name in the obvious way: it keeps all of its data in RAM. This is why it’s lightning-fast, and also why it’s so simple to configure. The drawback is that when your application ends (or crashes) all of the scheduling information is lost - this means RAMJobStore cannot honor the setting of “non-volatility” on jobs and triggers. For some applications this is acceptable - or even the desired behavior, but for other applications, this may be disastrous. In this part of the series we will be using RAMJobStore. draw-back is not terribly bad, especially if you build the database tables with indexes on the primary keys. On fairly modern set of machines with a decent LAN (between the scheduler and database) the time to retrieve and update a firing trigger will typically be less than 10 milliseconds. We will talk more about JDBCJobStore in the next post. TerracottaJobStore - provides a means for scaling and robustness without the use of a database. This means your database can be kept free of load from Quartz, and can instead have all of its resources saved for the rest of your application. TerracottaJobStore can be ran clustered or non-clustered, and in either case provides a storage medium for your job data that is persistent between application restarts, because the data is stored in the Terracotta server. It’s performance is much better than using a database via JDBCJobStore (about an order of magnitude better), but fairly slower than RAMJobStore. This is out of the scope for this series. The JobDataMap can be used to hold any amount of (serializable) data objects which you wish to have made available to the job instance when it executes. JobDataMap is an implementation of the Java Map interface, and has some added convenience methods for storing and retrieving data of primitive types. You can retrieve the JobDataMap from the JobExecutionContext that is stored as part of the JobDetail or Trigger. The JobDataMap that is found on the JobExecutionContext during Job execution serves as a convenience. It is a merge of the JobDataMap found on the JobDetail and the one found on the Trigger, with the values in the latter overriding any same-named values in the former. JobFactory - The default is Spring’s AdaptableJobFactory, which supports java.lang.Runnable objects as well as standard Quartz org.quartz.Job instances. Note that this default only applies to a local Scheduler, not to a RemoteScheduler (where setting a custom JobFactory is not supported by Quartz). ThreadPool - Default is a Quartz SimpleThreadPool with a pool size of 10. This is configured through the corresponding Quartz properties. SchedulerFactory - The default used here is the StdSchedulerFactory, reading in the standard quartz.properties from quartz.jar. JobStore - The default used is RAMJobStore which does not support persistence and is not clustered. Life-Cycle - The SchedulerFactoryBean implements org.springframework.context.SmartLifecycle and org.springframework.beans.factory.DisposableBean which means the life-cycle of the scheduler is managed by the Spring container. The sheduler.start() is called in the start() implementation of SmartLifecycle after initialization and the scheduler.shutdown() is called in the destroy() implementation of DisposableBean at application teardown. You can override the startup behaviour by setting setAutoStartup(..) to false. With this setting you have to manually start the scheduler. "cron": "0/10 * * * * ?" This will execute every 10 seconds by printing to STDOUT. One thing we did not talk about, the AdaptableJobFactory does not do any dependency injection. Each (and every) time the scheduler executes the job, it creates a new instance of the class before calling its execute(..) method. When the execution is complete, references to the job class instance are dropped, and the instance is then garbage collected. One of the ramifications of this behavior is the fact that jobs must have a no-argument constructor (when using the AdaptableJobFactory implementation). Another ramification is that it does not make sense to have state data-fields defined on the job class - as their values would not be preserved between job executions. In this post we learned how to schedule quartz jobs dynamically using RAMJobStore. In the next post we will learn how to persist these jobs into the database using JDBCJobStore.